I put 5 pictures from the Japanese embroidery I bought from Kinokuniya Bookstore in downtown Los Angeles on my flickr photostream. There are very few English words in the book. What I can gather from the photos and an internet search, it is about a collection of European Textiles that is either in a store or a museum in Japan. I think it may be a place like Lacis, which has a collection of laces and also sells needlework supplies. The author and collector is Yuki Pallis. That I can read on the copyright page. I hope she doesn’t mind the 5 photos I put on flickr. I took the dust jacket off the book and then laid the book open on top to photograph both the cover and inside. I love this type of floral embroidery. There is actually a pattern in the book for the embroidery on the hanging ornament in the photo below. 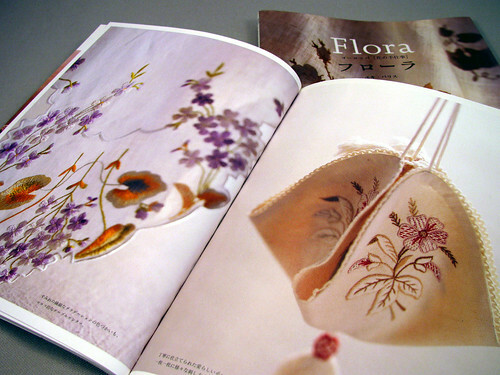 There are several nice pattern designs in the book, complete with stitching instructions. I can’t tell if they are new designs based on the old patterns or actually taken from the older European textiles. Well anyway, I love the way the embroidery goes to the edge of many of the embroidered pieces. Someday I will do this type of work, till then I will have this book for inspiration. This entry was posted on Wednesday, November 19th, 2008 at 3:00 am and is filed under Embroidery. Tagged: Book, Embroidery. You can feed this entry. You can leave a response, or trackback from your own site.